Located a short distance west from the DragonFly-In is the beautiful Black River. 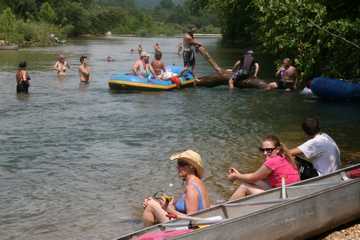 Its waters are perhaps the most crystal clear of any float stream in the Missouri Ozarks. Numerous liveries there can provide canoes, kayaks, rafts, or tubes for floats of any length from only a mile to more than twenty, lasting for as short as a few hours or as long as several days. The stream is floatable even in the driest summers, and passes among forested hills and limestone bluffs. Even novice canoeists will find the chutes and riffles sporting but not challenging. Along the way, the clear waters and gravel bars are ideal for swimming, snorkeling, and picnicking. Several cave entrances invite short explorations. Fishermen will find abundant smallmouth bass and goggle-eye, although wary due to the clarity of the water, so skills will be tested. 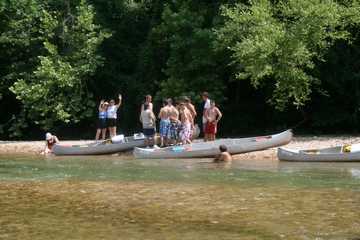 All the details of your float trip can be prearranged at the DragonFly-In. The liveries will schedule transport from your pickup point back to your site of departure. Their office stores can also provide supplies including food, beverages, coolers, and sunscreen in case our guests had not planned such an outing in advance.